More and more – even as the weather warms up – I’m finding that booties are my go-to choice when it comes to footwear options. They do have a way of adding that little bit of “edge” I always adore to just about any ensemble…like my otherwise conservative combo of this midi-length grey jersey dress layered over a pink-and-black dotted blouse. But there’s another reason, too – ever since the deep vein thrombosis I suffered in my right leg three years ago, I find I’m often more confident with my ankle covered. The mess of blue veins I was left with is probably way more obvious to me than it is to anyone else…but that’s immaterial, because in the end, what we wear is supposed to be all about allowing us feel our very best selves. So yay – booties it is!! And speaking of “go-to”?? I’ve had this Lucky Brand necklace on serious repeat ever since I first brought it home; so much so that my hubby thought it necessary to suggest I might want to switch it up for something different. 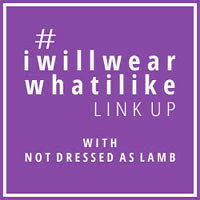 But sorry, honey…#iwillwearwhatilike !! OMG, Monika!! That's a fabulous way to add your style to this outfit!! OMG! This outfit is so cool! I love it! Perfect styling. Thanks for linking up to Top of the World Style. I love the touch of polka dots in this look. And your shoes are gorgeous!! I envy how you manage to get that blouse to look so flawlessly smooth under that dress. No bulk whatsoever. I struggle with layering my clothes.